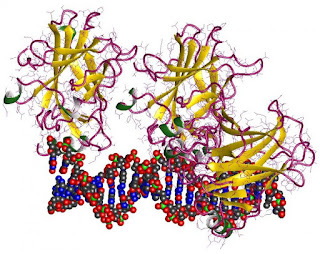 Tumor suppressor p53 trimer and DNA fragment. Before a malignant tumor is developed, the immune system tries to fight against proteins that are altered during their formation, producing certain cancer antibodies. A biosensor developed by scientists from the Complutense University of Madrid (UCM) has been able to detect these defensive units in serum samples of patients with colorectal and ovarian cancer. The developed method is faster and more accurate than traditional methods. When healthy cells are transformed into tumors, the expression of some proteins is being altered. As a defense, the immune system produces certain antibodies against them. The production of these autoantibodies start several months or even years before the disease is completely developed and detected by the clinicians. In collaboration with different hospitals and the Instituto de Investigaciones Biomédicas "Alberto Sols" (Madrid), scientists at the UCM have designed a biosensor capable of detecting these antibodies in serum samples from both cancer patients and patients at high risk of suffer from cancer in the future. To verify their effectiveness, the researchers applied the developed biosensor to the analysis of serum samples from four patients with colorectal cancer and two with ovarian cancer and treated at Puerta de Hierro and La Paz Hospitals (Madrid). In addition, they also used the biosensor to analyze the sera from twenty-four patients treated at Hospital Universitario Clínico San Carlos (Madrid) with high probability of developing malignant colorectal tumors due to a familial history of cancer. With the biosensor, the scientists detected the autoantibody content generated by the patients against the p53 protein. "This protein is known as the guardian of the genome because it repairs DNA mutations, avoiding alterations in the cell cycle and the appearance of tumors", says José Manuel Pingarrón, Professor of Analytical Chemistry at UCM and co-author of the work, recently published in Analytical Chemistry. When p53 is aberrantly mutated and multiplies without control, the immune system of between 10% and 40% of all cancer patients - depending on the cancer type they suffer - produces autoantibodies against p53, alerting of a possible malignant transformation. Compared with other methods that also detect autoantibodies against p53, the biosensor demonstrated a 440-fold higher sensitivity and a better discrimination between positive and negative serum samples to p53 autoantibodies. Another advantage of the developed biosensor is its handling simplicity and speed. In less than six hours the complete test is performed including the expression and purification of p53, in contrast to the weeks or months necessary to develop the traditional methods (in which the protein is produced and purified separately from the assay). In addition to be used as an early diagnostic method in liquid biopsies, the biosensor can be used to monitor the course of the disease in patients with autoantibodies to p53. It has been demonstrated that when the tumor burden disappears, the levels of these antibodies to p53 decreases until normal values. The patients who participated in the study with high probability of developing colorectal malignant tumors are currently undergoing exhaustive follow-up by clinicians at the Hospital Universitario Clínico San Carlos (Madrid).